Water has enormous erosive potential in arid environments. Changes in climate causes stream terraces to form. Stream terraces are formed when streams carve downward into floodplains, leaving steplike benches along the sides of a valley. In present-day landscapes, when geologists find older stream terraced surfaces that have no obvious connection to a modern drainage system, it provides a clue to the area's past climate. Sometimes old terraces have been weathered in such a way as to expose some of the soil or subsurface structure for more insight into what the ancient ecosystem was once like. Stream terraces exist throughout the western regions of the United States, such as in the Mojave region of California and the San Juan River area of Utah. When an area is cool and wet, there is ample vegetation growing on the landscape to protect the soil from erosion. During dry periods, however, plants struggle to survive, and many die off, leaving the ground bare and exposed to intense erosion during the infrequent but often powerful storms. Under the cooler, wetter conditions of an ice age, soil development and weathering processes are much more rapid. During multiple freeze-thaw cycles, when material is continuously wetted and dried, rocks are physically torn apart. 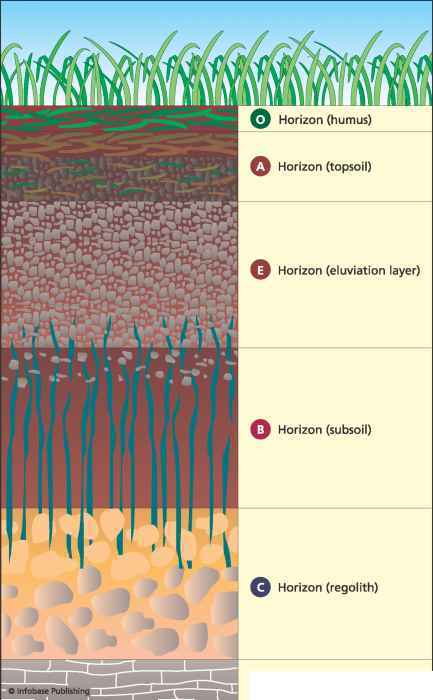 In addition, biological activity, such as plant's roots penetrating the ground, can also weather rock, forming soil horizons. This weathering supplies large deposits of sediments that can be transported to new locations when a water source becomes active again. Climate is also a major factor in the formation of caliche, a calcium carbonate-rich crust that forms in the stony soil of arid regions. It forms when water evaporates at the ground surface and calcite cements the surrounding sediments together. Caliche is commonly found in the southwestern portion of the United States. Sometimes caliche deposits serve as a resistant caprock above isolated stream terraces, protecting them from erosion. Another feature of arid landscapes that speaks of past climate are remnants of ancient lakes. In the United States, the last major ice age, which ended roughly 14,000 years ago, had a significant effect on the weathering and erosion patterns of the Southwest. In California and Nevada, many ancient lakes existed, such as Lake Tecopa, Silver Lake, Soda Lake (Lake Mojave), Coyote Lake, Lake Manley, Panamint Lake, Owens Lake, China Lake, and Searles Lake. These lakes were contained geographically within the area bordered today by the Sierra Nevada, San Gabriel Mountains, and San Bernardino Mountains in California and Las Vegas and the Colorado River in Nevada. Excavations into dry lake beds have produced fossils of shelled invertebrates, fish, and plants that could have survived only in a lake environment, allowing climatologists to piece together a climate time line. The climate-induced formation and disappearance of lakes has also influenced the development of river systems in the region, leaving evidence across the arid landscape. During the ice ages and wetter periods, large river systems probably existed with diverse fauna and flora. One of the more famous of such lakes during this time was Lake Bonneville. 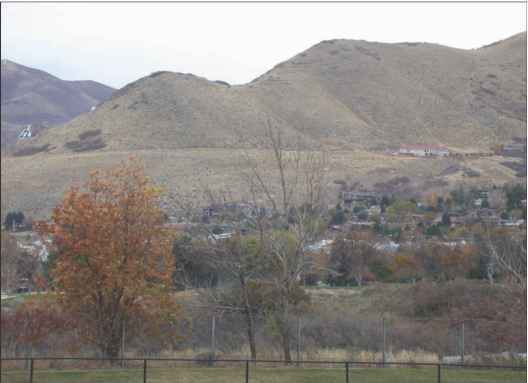 It existed from about 32,000 to 14,000 years ago and occupied the lowest closed depression in the eastern Great Basin. At its largest extent it covered about 20,000 square miles (51,800 km2) of western Utah and smaller portions of eastern Nevada and southern Idaho. Melting glaciers fed the lake. Today, researchers study the fossil record left behind by mammoths, mastodon, musk oxen, large-horn bison, camels, giant beaver, giant wolves, giant bears, big-horn sheep, giant ground sloths, short-faced bears, and saber-toothed cats. They also study the glacial deposits and landforms of the area as well as the distinct shoreline left by the lake, as seen in the photo. Climatologists have identified several climate forcings in arid environments that help them successfully reconstruct the Earth's past climates. The arid ecosystem is so fragile and responsive that climate affects nearly all aspects of the biosphere and landforms in such a region. According to the USGS, the illustration depicts climate-induced forcings involving lakes, plants, animals, soils, and landforms. accelerates soil formation. During this phase of the cycle, sand supply to dune fields in arid regions is at a minimum. Then, when dry conditions prevail, the phase shifts: Plant cover decreases, and desert storms erode soil and provide a source of sand for alluvial fans. Scientists acknowledge that more research is needed to quantify both the short- and long-term effects of climate change on the various surface processes that affect the life-forms, water supply, and geomorphic processes that operate on the landscape, such as the effects of landslides, changing water tables, changing water quality, and erosion rates. In a desert environment, climate is interrelated with many physical features, including lakes, plants, animals, soils, sand dunes, and other weathered material. Over time, wet and dry climates are each associated with specific desert features. fairly rapid in arid climates. Another indicator of past dry climate is that soils form very slowly, leaving most bedrock exposed to erosion. There are many physical processes always at work on the desert landscape. Deserts have wide temperature ranges. Although it can become very hot during the day, it gets very cold at night. The constant cycle of heating and cooling weakens rocks and breaks them apart over time along areas of weakness, such as cracks. Once the cracks appear, plant roots can grow in them and widen them, and water can run into them. When water freezes, it expands; when it melts, it contracts and flows out. This is referred to as a freeze-thaw cycle. A rock can undergo hundreds of freeze-thaw cycles, which further weakens the rock and breaks it apart. Exposure to wind and precipitation also causes distinct weathering patterns on landscapes that can clue geologists in to desert landscapes of the past. 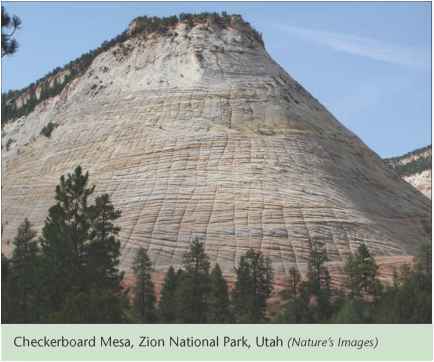 The geologic formation in the photo is Checkerboard Mesa, located at Zion National Park in Utah. The deep furrows in this formation have been cut like a checkerboard over millions of years. The horizontal furrows were carved out during the Jurassic period by windblown sand off huge ancient sand dunes that spread across the landscape. The furrows were then widened and split vertically in joints due to a climate favorable to multiple freeze-thaw incidents. This unique landform tells a story in itself about past climatic conditions of the area. When rainfall occurs in desert regions, mountain slopes become saturated. This can cause what geomorphologists refer to as mass movement—the downslope movement of a portion of the land's surface. Mass movement can occur sporadically, as in the case of rock falls; quickly, as in the case of landslides and mud slides; or slowly, as in the case of creep. Although rain does not fall often in a desert, when a storm does occur, it is usually very destructive. Because so little vegetation is available to provide stability to the soil, the water is able to erode and move large amounts of weathered material in a single incident. Sometimes a huge boulder may end up on a flat desert plain as a result. Flash floods and debris flows leave their marks on the landscape, which can also be interpreted by climatologists. Carbonate sedimentary rocks are another key arid environment feature. These are common in the southwestern United States. Carbonate rocks originate from limey sediments composed of the calcareous skeletal remains of algae and invertebrate shell material or from calcium that precipitates directly from agitated, warm seawater. This usually signals an environment such as a shallow continental shelf in a warm, tropical climate. These deposits alone give climatologists a good look at the climatic past of the American Southwest. Many of these deposits have been dated to the Proterozoic and Paleozoic Ages. Most of the ancient limestone formed from planktonic algae, but in the late Paleozoic time, coral reefs also became key producers of carbonate sediments. Limestone is mostly made of calcite (CaCO3). The Mojave Desert has many such deposits, suggesting its past climate was once a shallow ocean maritime environment. Freshwater limestone deposits referred to as tufa occur around springs and in areas where ancient lakes' wave zones reached them. Pediments, alluvial fans, and playas tell their own stories about past climate. A pediment is a gently sloping erosion surface or plain of low relief formed by running water in an arid region at the base of a receding mountain front. An alluvial fan is a deposit built from material deposited from a stream that flows down a canyon and empties out onto a valley floor. Once the stream reaches the open valley and is no longer confined, it can migrate back and forth, depositing its sediment load in the shape of a large fan, with its point at the mouth of the canyon. 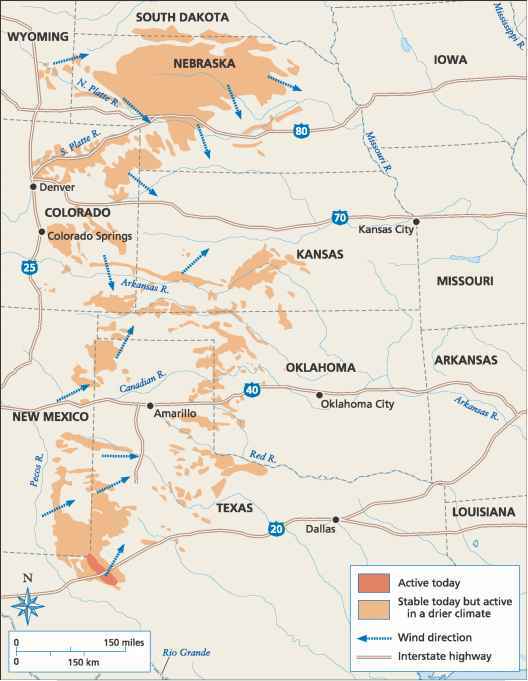 Sand dunes covered much of the Great Plains region in ancient times. Today they are stable, but if the climate becomes drier, as with increased global warming, the sand dunes could become active once again. concluded that the climate of the region transformed over time from seasonably wet to arid. This period also marked a significant span of time when vegetation made a major shift from widespread flora to the more sparse vegetation seen today. Playas can have lakes in them during wet periods. The dry lake bed is typically made up of stratified clay, silt, sand, and soluble salts. Common in the intermountain basins of the American Southwest, playas interest climatologists because they can often reveal information about past climate. During the last glacial period, many playas were lakes and marshes. Then, about 8,000 years ago, these bodies of water dried up. Today, they flood only after seasonal storms provide flash-flood waters or if a spring develops nearby to provide a source of water. Sand dunes and dust are other important desert features that can reveal much about past climate. Sand and dust transport plays an important role in shaping the landscape. Dust and sand can come from weathered rock, alluvium, and dry lake beds. Prevailing winds can carry clay and silt particles large distances. Wind moves sand along the surface as a saltating bed load. The moving sand stalls and accumulates as dunes where the wind rises over a significant barrier, such as a mountain. As long as there is a source of sand, dunes develop and form. As climates change from wet to dry, dune systems are repeatedly formed, stabilized, destroyed, and reactivated over time. Ancient dune systems exist today, covered by vegetation and stabilized, and provide important information to scientists about past climate. Some may even have fossil ripple marks exposed on them. Examples of stabilized dune fields in the United States are the dunes in the Plains states. As shown in the illustration on page 67, most of these dune fields are stable, but at one time in the ancient past, under the influence of a different climate, they were all very active. 1930s. This causes concern for climate scientists because the dunes have been active under climatic conditions that are not much different than those of today. If the dunes were reactivated because of global warming or natural climatic variation, it would cause significant changes to the land. For example, farm and range land could be destroyed, transportation networks shut down, and wetlands and wildlife habitats damaged. This is one major reason why the USGS conducts field investigations and works with land management planners. How does water help in shaping the landscape of the arid environment? How does weathering contribute to the development of arid land scapes? How are arid landscapes formed? How do landscape features in arid areas being formed by water process? How is physical and chemical weathering complimentary in shaping out desert landscape? What are the surficial processes that affect arid landscapes? What is the weathering pattern in arid zones? What are the landforms of an arid landscapes? What shapes the landscape of arid environments? What are landforms that can be found in an arid environment? What are the landform of arid environment and humid environment? How do arid landscapes form? How does water affect the development of arid land scapes?